1-Raise awareness of the growing cleavage between science and society. This technological divide is caused by our political and industrial leaders’ inability to keep up with the pace of scientific discovery. Joël de Rosnay actively seeks to reduce this gap through the dissemination of timely research and ongoing advocacy. 2-Bring to light those converging scientific and industrial paths that stand to have the greatest impact on the evolution of human societies. Give special attention to biotechnologies, information flows and the environment, highlighting their inherent risks and challenges, as well as the promise they hold for the future. 3-Empower societies to reclaim technology and use it as a force for change, both at the individual and collective level. Showcase the growing influence of France’s education and research organizations in this regard, and their unique culturally-diverse approach that enables individuals to assimilate innovation in their daily lives…and in how they imagine their futures. Grasping the complexities of the modern world. Fashioning the future, rather than passively accepting it. Loving and sharing this vision of an empowering future. Co-creating the future we collectively want. And preparing today’s strategies to build and embrace our common tomorrow. 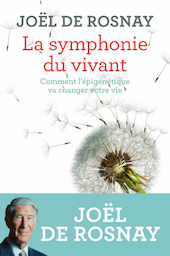 This is what drives Joël de Rosnay and Biotics.